Stunning satellite images show summer ice cap is thicker and covers 1.7million square kilometres MORE than 2 years ago…despite Al Gore’s prediction it would be ICE-FREE by now. If you didn't know how the denialati operated you'd probably be stunned alright. Stunned at their stupidity. Last September 21, as the Northern Hemisphere tilted away from the sun, scientists reported with unprecedented distress that the North Polar ice cap is "falling off a cliff." One study estimated that it could be completely gone during summer in less than 22 years. Another new study, to be presented by U.S. Navy researchers later this week, warns it could happen in as little as 7 years..
What neither Anthony nor David Rose point out is that the Arctic sea ice is closely following the same trajectory as 2013. Yes, that's right. The summer sea ice extent is very similar to that from last year. There is no reversal. Here is the chart from JAXA, with lots of years. This year is similar to 2013 and 2010. Click to enlarge or click here to go to the source (choose the old style of plot to see more years). Arctic sea ice extent is well below average, and large areas of low concentration ice are observed in the Beaufort Sea and along the Siberian coast. However, it is highly unlikely to set a record low at the end of this year’s melt season. Antarctic sea ice extent remains at record highs. Neven's Arctic Sea Ice blog is the place to go to discuss all things icy. The NSIDC's regular updates are excellent to stay up to date. WUWT and the Daily Mail are very dubious sources for information about anything. @ret_ward @curryja you clearly haven't read it properly. It suggests decline may be slowing, not stopping. You sure it's not, guru Bob? David Rose is doing his old trick of using record low extents as his baseline. 2007 and then 2012 were record lows so any return to the trend line looks like a recovery. But that’s not the story at all. The Arctic is still losing ice sheets and sea ice. The trend line continues in the wrong direction. No, not David Appell, Peter Grace is a valid commenter, though perhaps misguided. Today the LA times had an article on arctic sea ice and the fact that it was expanding sooner and greater than usual. Even though in the article sub headline they said “scientists aren’t sure how” it went on to blame it on AGW. More theories about increased winds as a result of warming being the culprit. What will it take for people to understand the scam? The westerly winds blow fierce and constant around Antarctica, isolating the continent in a kind of permanent polar vortex. Scientists think they exert the most direct control over the state of Antarctic sea ice. Ice requires cold temperatures to form, and winds help it grow by blowing it around the polar ocean. When the ice moves, new water is exposed to the chilly air, creating an opportunity to make more ice. In the landlocked Arctic, winter sea ice gets hemmed in by Russia, Greenland, Canada and Alaska, said Thorsten Markus, head of cryospheric sciences at NASA's Goddard Space Flight Center. But in the Antarctic, unflagging winds push ice ever farther into the empty Southern Ocean. Goodness, Arctic ice recovering rapidly, Antarctic hitting a new record every other year. Much more of this global warming and we’ll be in an ice age. You call freezing the right direction?! Ice ages have been worse for humanity than climate optima. There’s nothing wrong with having trees in the Arctic region, where they used to grow. 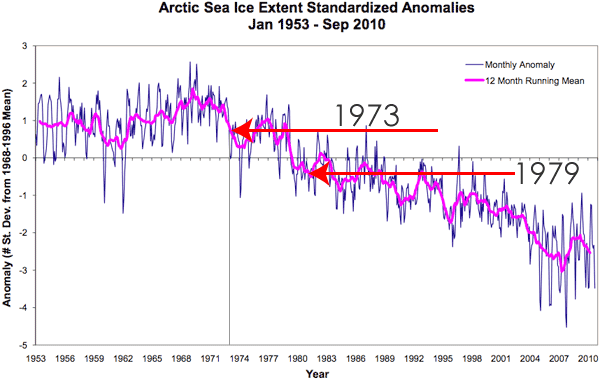 How does that compare to the old trick of starting the Arctic ice extents record at a cherry picked 1979. anybody who has perused AR1 knows that the satellite record began in 1973 and Arctic ice extent rose substantially to a peak in 1979 before the allegedly precipitous and apocalyptic decrease to modern extents. Trend limes depend on starting points, don’t you know? There's also a nice paper by Walt Meier and colleagues about sea ice extent since the 1950s. Arctic sea ice is acting just like natural cycles would predict!!! No Jim. With natural cycles on their own (without human-induced warming) no scientist would have predicted sea ice extent as low as it is now. There is no plausible mechanism by which the ice extent could get so low without factoring CO2-driven warming. For example, this paper suggests only a small amount of the changes in Arctic sea ice can be attributed to the AMO. Denial depot is a satire site (and it's hilarious too). You can't really use it as an indication of denier think. Although I have had a few deniers link me to some of their articles as serious arguments before, always good for a laugh. Au contraire, Inferno gives us many exquisite examples of denier think, even anticipating their "faster than ever recovery of Arctic sea ice" - which deniers indeed came up with in 2012. Arctic sea ice will now recover double fast. Headline: "Sea Ice News Volume 3 Number 14 – Arctic refreeze fastest ever"
WUWT is its very own satire! Professor Inferno did show considerably more wit than your typical denier site. But other than that he explored the same memes, only he always took care to show how ridiculous those memes were even while posing as a rabid denier. But some denier stuff goes way beyond anything Professor Inferno attempted: 'Russian steam pipes', and 'The camp that warmed the Antarctic Peninsula' come to mind. But Sou, I never claimed that deniers never made the claim that Arctic sea ice was recovering. On the contrary, satire is only funny if it's accurate! But DenialDepot is a blog written by an AGW proponent, and it's sending up deniers. It's therefore unfair to use it as a source for a denialist claim. You should link to the WUWT article instead. Actually, re-reading my initial comment, I understand your response now and clearly my initial comment was worded poorly. You are right, you can use DenialDepot as an "indication" of denier think, since it's based on real denier memes. However, I still think referencing it as "deniers made claim x" is misleading since it's not a real denier site. Hmmm... Here I am, back again. How to explain that? Maybe it was Millicent's dramas with small penises or maybe it's just that I am a sucker for punishment. Now, this ice extent post is a great example of my earlier observation that so many of your posts are largely regurgitation of alarmist and denier arguments alike. But I am impressed that you manage to churn out so many posts, all with extensive links and examples, so clearly you are retired or have such a frothing dislike of deniers that you work your fingers to the bone fighting the good fight. Shame you seem to have an audience of maybe 6. Now, you accused me last time of being content free, and you'd be right. I have the limitations of lack of time to read as widely as I should, limited smarts (heck I wear my cap backwards and my best gal is my cousin so what can you expect), and of course I am not 'in the trade' so to speak. However, I'm willing to offer up some thoughts of my own, such as they are. First, your blog post is ridiculing WUWT for observing that the sea ice has stopped its death spiral. I think that's a fair observation on their part. I haven't read Judith Curry's quoted comment to see it in context, but I think that for the moment she's right. Now, clearly the trend for the period from 1979 until the mid 90s was largely stable with perhaps a mild decline. From the high of 1997 until the 2007 record low, the trend was startlingly down, which of course is where the cries of death spiral came from and what Gore was referring to. In the early 2000s it would have undoubtedly looked as though the trend was unlikely to reverse. CO2 was and is inexoraby rising and at that time natural variability was largely considered unlikely to trump anthropogenic forcing. But since 2007, what do we see? Well, on eyeballing that graph, I see an overall positive trend. Feel free to crunch the numbers properly and see what you get. OK, that's only 7 years and I'd hardly call that long enough to draw any really solid conclusions. But I'd be happy to suggest the 'death spiral' has reversed for now. Exactly as Curry and WUWT claim. Ice volume anomaly seems to support this conclusion. Now, I'll agree that this current situation means nothing. How it stands in context will not be obvious for maybe 20 years yet, and of course the long term trend remains down, though with less steep a descent. But the claim, that the death spiral has reversed, is on short term trends quite correct. And dont forget the record Antarctic high ice extent. Oh sure, there are no shortage of explanations developed with hindsight, but I don't recall seeing too many suggestions that might happen 10 or 15 years ago. No, as far as I can see, the death spiral has for now reversed. Arctic ice is on the up, Antarctic ice is on the up, and of course so too is global ice. Lastly, just out of curiosity you mention the AMO as being insufficient to lead to the ice decrease we've seen this past 30 odd years. But there are more than likely other factors that could come into play. For example, do you have trend data for salinity from 1980 until 2010? I'd imagine that if salinity is decreasing it'd lead to slower or more constrained ice formation if surface/ocean temps have warmed for whatever reason. If you turn the sea ice charts upside down or squint a lot, or shut your eyes completely, and take a big dollop of confirmation bias denier style, you can dispute all the experts and argue that the Arctic Sea Ice has made a dramatic recovery so much so that it hasn't just stalled, its completely reversed the death spiral. And Antarctic winter ice growth means we're heading for an ice age. BTW - the PIOMAS chart Billy Bob gave a link to, has the volume straddling the long term downward trend. Not a reversal in sight. It's barely touched above the trend let alone reversed it. Two years does not a trend make. Sou even has a graph from the NSIDC up there which rather clearly demonstrates the amount of natural variation in Arctic sea ice extent year to year. Including a number of times in the previous 35 years where the 'short-term trend' you refer to was opposite to the actual trend. You're fitting noise, not signal. As for sources of ice melt, you do realise that every observation we've got shows the arctic as being one of the fastest-warming regions on the planet? "Ice extent this year is solidy above the lows of 2007 and 2012..."
Er, yes. Is that not what is called cherry picking? Pick the low years and compare them to the current - lo and behold they are higher! "... the really interesting feature is the short term trend." Really? That sounds like cherry picking too. Ah - now I understand why Sou says turn the graph upside down. You appear to not understand anomalies, or negative numbers, or which way ice extent goes - or something. Yep, pick the two lowest years on record and claim the trend has reversed. The Arctic sea ice spiral started reversing in 2013! The same inability to separate short term noise from long term trends had deniers telling us some time ago that sea level rise had stopped. Its another indication that deniers are stupid or else are shills writing for a stupid audience. "And dont forget the record Antarctic high ice extent. Oh sure, there are no shortage of explanations developed with hindsight, but I don't recall seeing too many suggestions that might happen 10 or 15 years ago." Of course, you don't recall! You'd have to read the scientific litterature for that. But I suppose you don't read the scientific litterature, do you? Anyway, Manabe et al. made that suggestion 24 years ago. "I'd imagine that if salinity is decreasing it'd lead to slower or more constrained ice formation"
You have an active imagination. Decreased salinity promotes ice formation - not the other way around. I've tested this myself. I put salt on my driveway in the winter. It makes the ice melt faster. Try it sometime. On a side note, Sou has an audience of seven. I just don't always comment here, because I usually spend my time reading the sciencey stuff first. If two years is a recovery, how many times has the ice recovered during the period of observations? Denier are just pathetically gullible. You have no idea how many are reading Sou's posts, only how many are commenting. Those six or seven readers are very keen (and use a lot of different pseudonyms). Between them they've looked at one or other pages more than 1.4 million times in the 20 months or so since HW started, using more than 90,000 different computers. They are very well traveled, too. Logging in from at least 181 different countries and five continents - I'm not sure if any of them have logged in from Antarctica. The trouble with warmanistas is that they keep showing faked graphs. http://denialdepot.blogspot.co.uk/2009/09/arctic-sea-ice-staggering-growth.html showed us how to tell the truth about Arctic ice recovery! Typical of environazis to worry more about spelling than telling the truth that we are about to enter a brutal ice age! @WR You're a Poe right? You can't possibly be serious? You link to a parody site with a tilted chart and then go all ice age cometh. Top marks for comedy. OK, that was funny, although I couldn't laugh at everything because it came a little too close to stuff I've read on WTFUWT. When reality exceeds imagination: I give you the Mörner/Monckton tilted sea level graph. "Typical of environazis to worry more about spelling than telling the truth that we are about to enter a brutal ice age!" Hey, in the coming (brutal) ice age its going to be people who can spell words like 'Inuit' who survive. Oh, thanks, TrueSceptic. I was trying to remember where that page had got to. It's got nowhere to go but up! One thing nobody at WTFUWT seems to have mentioned is their collective prediction for minimum sea ice extent of 6.11 million sq km. for 2014. It's currently 5.22 million and falling. As Anthony is prone to say: " I call fail". Possibly the Wattites were taking the increase in minimum extent from 2012 to 2013 and assuming the same increase for 2014 compared with 2013. Such an assumption would lead to more or less their predicted figure.A case of the triumph of fervant desire over statistical rigour. And this lot still sneer endlessly at the supposed statistical incompetence of climate scientists. Blather bluster waffle... WUWT reported an article which observes quite accurately that sea ice has indeed 'recovered' in the past few years, at least as far as minimum extent goes. But we also see an increase in ice volume and multi-year ice. Sure enough, the death spiral has reversed. For now. Sorry guys. Of course I accept your points about noise, long term trends and so on. That's all true. But, how you gonna feel in 10 years if that trend is still back up. Let's wait and see eh? But given that sea level rise isn't playing ball and surface temps have stopped warming, well... There's a good chance you got it wrong. Regardless, the fact is that WUWT is quite right in what it has reported. You just don't like their enthusiasm for the facts. As for you Millicent, maybe my age is getting me down. But my denial is getting stronger. What can I say? "Blather bluster waffle... followed by Of course I accept your points about ..."s, let me get this right. You accept our points. Check. They are blather, bluster etc. Check. WUWT observes quite accurately... Logic error. You cannot have it both ways. You need to put something in the middle so we can see where you go off the tracks. But as a logic challenged denier you will just skip, skip around. You cannot risk being pinned down can you? "The past few years" is a case of temporal drift; 2012, a mere couple of years ago, was a record low extent. SInce then we have seen, not unexpectedly, regression to the mean. Care to make a date for this time next year, same place, to discuss the 'recovery' further? By then it'll have been a few years (lets call it 'about five', yeah? Or would you prefer 'up to ten years'? Whatever, we can discuss that then ) since 2012. Meanwhile, how's about that falling sea-level? Keeping up, is it? Billy Bob is nuts. Or perhaps he thinks if he swears long and loudly enough that white is black someone will believe him. It's not just Billy Bob losing his memory, getting his years all mixed up, mistaking the year before last for 1983 or whatever. Now David Rose, who is a much younger man by all accounts, is losing his memory as well and is trying to deny his denial. He can't even remember what he wrote a day ago, let alone remember what happened a year ago. Billy Bob - After the arctic record low year of 2007 came 2008 and 2009 which caused the pseudoskeptics to claim the ice had 'recovered' - of course it hadn't in any meaningful sense, it was just returning to trend. So, after the arctic record low year of 2012 we've seen 2013 and 2014 revert to trend and *again* we see pseudoskeptics claiming the ice has 'recovered,' but this should really be *re-recovered* - since it had *already* recovered following 2007 . None of this pseudoskeptic recovery business is backed by any science. They just point to one or two years data and immediately say the trend has reversed. Science, OTOH, actually tells us to *expect* reversion toward trend after anomalously low loss years. In fact, if we removed *ALL* of the sea ice today, we'd fully expect it to 'recover' toward trend over the next 4 or 5 years. I.e., it wouldn't remain ice-free, but accumulate ice until it reached an amount close to trend. Mmmm... "reversion to the mean". Or in common language in this case, going up. Call me in September 2016. I've got it my diary. Dress it up however you like guys, it's increasing. Maybe you are right and in 10 years we'll see how it fits the overall distribution, and maybe you are wrong, hmmm? Falling sea level Cugel? Whoever said it was falling? What it's not doing is accelerating. Pretty steady for about a century is what I see. So.... SLR steady, temps not increasing, polar ice on the up at both poles... Cool, I won't need that Bex after all. Which is a good thing eh? Nobody said, "reversion to the mean". And why is this troll being fed? It's clear that he's here to agitate, not to learn. Do you suffer from failing eyesight Billy Bob? The charts above show that this year's ice extent is *well below* the mean of the the 30 years ended in 2010. A long way below the mean. And the mean from 1981 to 2010 is itself way below the mean from 1961 to 1990. There is no "reversion to the mean". The *trend* itself is down and dropping quickly. I don't know if you need new spectacles or if you are confusing the downward sloping trendline with the thirty year mean. These are very different beasts. The downward *trend* is steep. Go back and look at the PIOMAS chart you had. See where the volume is above the trend for much of 1986 to 2006 and below it before and afterwards. It has to be, or you wouldn't have a trendline. The trendline goes through the middle. It has some years above and some below. For most of the past few years it's not just below the mean, it's been well below the trendline as well. It would have to be above the trendline for quite a few years before the downward trend could be said to shift upwards - and it's barely touching the downward trend line at the moment - so you'll be waiting long past 2016 to be able to say what you want to believe. Sheesh - have no deniers ever done any arithmetic? Have they never learnt how to read a chart? Billy Bob is not just a denier, he's abysmally ignorant and doesn't have the education to understand the first thing about science. I think he's pining for the HotWhoppery. There's frequent allusion to regression to the mean on e.g. Neven's blog, but that implies regression to the linear trend -- which is sharply down. There is also the same discussion on tamino's blog regarding temperatures. What the? You might be right about my specs Sou. Wheelism, both Bill and Cugel above mentioned regression to the mean. Did I misunderstand what they meant by that phrase? Billy Bob - why not read the actual scientific papers cited, then discuss? Otherwise you're simply speaking from ignorance. I can't read your mind, Billy Bob, but I can read the words you write. If anyone wrote that the Arctic sea ice is reverting to any long term mean they were wrong. Regression to the mean is what happens in setup where the long term trend is zero. Sometimes an observation would be above and sometimes below the mean and over the long term observations don't stray too far from the mean. If the trend were steady, the same thing would apply - sometimes an observation would be above the trendline and sometimes below it, without the trend changing. 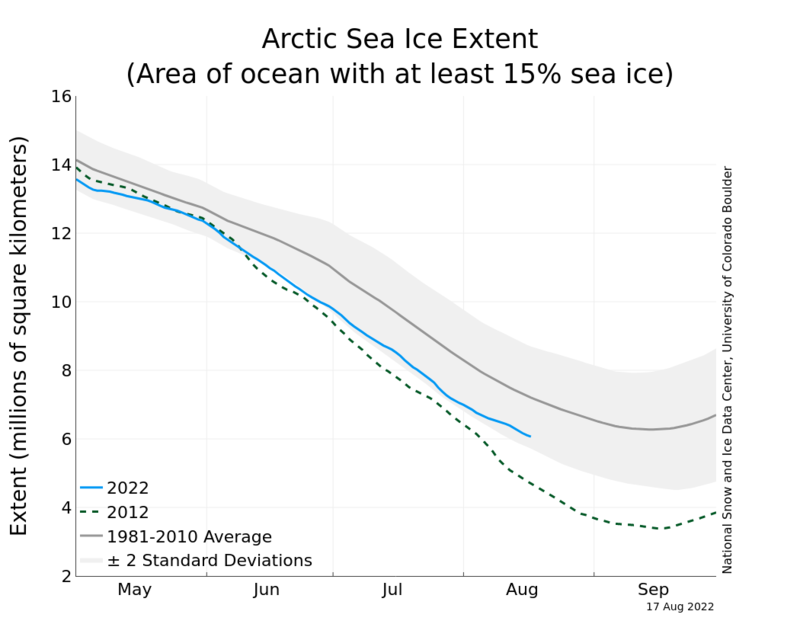 In the Arctic, the long term mean itself is on a decline. 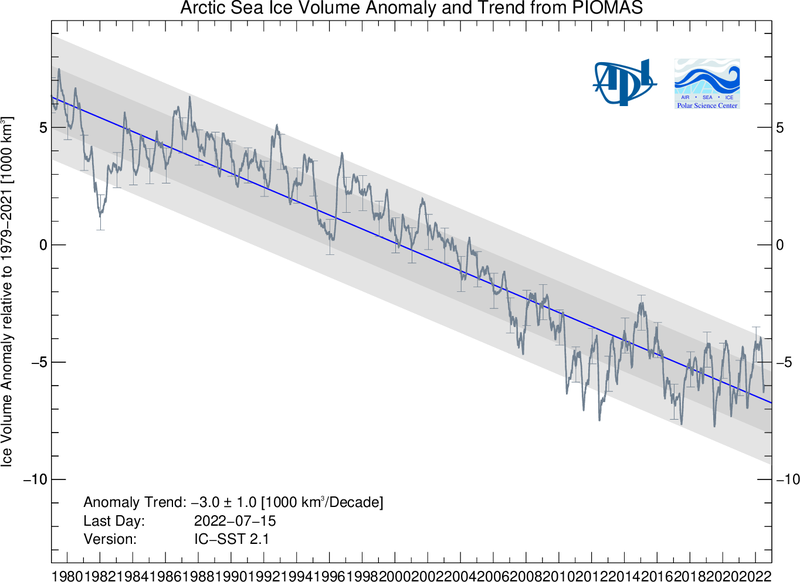 Summer sea ice has been battling to stay on the long term downward trendline, let alone move above it. It's disappearing very quickly. since 2007, what do we see? Well, on eyeballing that graph, I see an overall positive trend. That's where you go right off the rails. First, on that volume anomaly chart you referred to, the actual volume has barely touched the downward trend line. There is no way that the trend has shifted to positive. Again, that's your confimation bias working or you're looking at the chart upside down. The lowest anomaly in 2007 was more than minus 6,000 cubic km. In 2008 it was greater still, more than minus 8,000 cubic km. Only the year before last, in 2012, the volume anomaly was more than 9,000 cubic km below the 1979 to 2013 mean. Think about it. This is below the average from 1979 to 2013. We're not talking about an average from long ago. ...the claim, that the death spiral has reversed, is on short term trends quite correct. No. It's not correct. There you contradict even yourself, claiming that there has been a reversal in trend. The only way you could say that is if you define short term as 24 months, which is supremely ridiculous. It's almost as ridiculous as if you were to claim that winter is colder than summer so we're heading for an ice age. You seem to think that there is no variation allowable. That one year cannot have more ice than any previous year without it being a trend reversal. It takes a lot more to reverse a trend than that. If you want to learn how to read a chart, I did a video a short while ago. See if you can learn anything from it. The example I used was surface temperature but the principle is the same for any chart. I think when bill and cugel mentioned "reversion to the mean" they actually meant "regression to the trend". That's clearly what is happening in the graphs provided, 2012 was well below trend and as Sou mentioned previously, while extent has gone up these last two years (from record lows), they are still following the long term trend. There is nothing unusual about the sea ice going up in a couple of years. So Billy Bob, while you can always cherry pick some short term trends that are increasing in sea ice extent, in the end these "trends" are meaningless - they certainly don't provide any evidence at all for the comething ice age. Indeed, regression to the trend. Don't get all worked up over Billy Bob; he's only yanking chains here to get a rise. Nobody is so moronic as to believe what Billy says. Twisted behavior, yes, but so stupid? Not bloody likely. There's a bunch of these wags in circulation. The Goat, etc. BTW, don't feel badly about being led on. There's a whole crowd of people who eagerly nod their heads in agreement with patently idiotic claims made and intended only as strange jokes on the part of Billy Bob and his ilk. Billy reminds me of Rumsfeld seeing how far he go in testimony before the US senate prior to Iraq. "Oh, yeah, there are hundreds of miles of tunnels full of WMD in Iraq! (isn't a single one of these chumps going to call me on my BS, already?)" Make your mind up. Either "Nobody is so moronic as to believe what Billy says." or "There's a whole crowd of people who eagerly nod their heads in agreement with patently idiotic claims made ...". Yes, what do they believe? Good question. Anthony has now graciously released all my comments (thus far) from purgatory. A certain "Hanzo" seems to have got the message, even if Watts et al. have not. All of which reminds me that I may meet the great man in the flesh shortly. He is reputed to be heading to Bristol on the 19th to see John Cook in action, as indeed am I! I am hoping to be there as well. (Bristol). That's a long standing joke over on the Arctic Sea Ice Forum. How's this instead? "...there are clear signs with global warming slowing down...weakening El Nino strength and other measures..."
"...which is strong confirmation of the cycle..."
"However, with at least the same amount of high confidence, the cycle exists ..."
Can you give a reference paper that puts some statistical analysis and figures on this high confidence? Two cycles does not quite seem enough to generate high confidence. His comment can be seen in the HotWhoppery if anyone feels like being befuddled. Oh Meteormike. You have been moderated out. Commiserations. Though I am not completely surprised after I had had a look at your links. Why are all the papers from the 1990s? Sounds like an expired line of research that did not go anywhere? Why do they say things like the PDO cannot be modelled or predicted and several cycles of different durations have been postulated? All in all it looks to me like your "high confidence" claims are a product of your overactive typing fingers and not based on any sound science. Don't you know that making stuff up gives deniers a bad name? Let me get this straight: we are supposed to think there must be a ~30 year cycle in the PDO although there is no known mechanism that could be driving the cycle, and insufficient data to prove its existence? Is this with or without the mysterious Force X? I shall update my Climate Elves theory accordingly. Oh come on Millicent! Of course it is with Force X. Else Force X would not exist, would it? I'm sorry, but citizen science, with all these mysterious forces, and cycles, and imminent reversals of trends (that somehow never actually reverse at all) make me quite giddy. "Mike sees patterns in the PDO where none exist. It's no surprise that he can't decide if it's a 30 year, 60 year or 90 year cycle"
His comment can be seen in the HotWhoppery if anyone feels like being befuddled." Thank you Sou. Now more folks can see the PDO cycle. Just to be more clear on the PDO, in case I wasn't before(which is possible). It spends ~30 years in its warm phase(+PDO), then ~30 years in its cool phase -PDO. So you can refer to it as a ~30 year cycle which is the period between changes/phases or a ~60 year cycle which is the entire period that it repeats, that includes completing both phases. Identifying it is as easy as noting the prevalence of the blues(-PDO) and reds(+PDO) that represent those vaules over periods of 30(60) years. It does not stay negative/positive for exactly 30 years or last exactly 30/60 years. As with many natural cycles, it's effect on the atmosphere/oceans averages out over that ~30 period to be in a specific direction that is the opposite of its effect over the previous ~30 years. Over much shorter periods within the cycle, there can be exceptions. Like I said, you see patterns that don't exist, Mike. Have another look at your chart. The PDO can be in one phase for as short as ten years or as long as 40 years. There is no set 60 year cycle. If you tried to answer the points that have been raised you might get some credibility. Just repeating what you said before does not make it any clearer or more believable. You could start by admitting there is no basis to describe these cycles as "high confidence". And explain why all your material is over 20 years old. And why that material suggests a variety of time periods. And no, no no. You cannot just eyeball a graph and claim to see cycles in it. It is rather more complex than that. Amateur! As discussed and illustrated, the PDO cannot directly explain global temperature variations because it represents a pattern of SST variability, not SST. Actually, Mike, you and Bob have quite a bit to chew over. There does not appear to be a persistent 60-year cycle in any of the PDO reconstruction datasets. One of you must be wrong. "You should take this up with Bob Tisdale"
I am relating my own view/analysis of what I see. Are you thinking that Bob and I are on the same team or should be conveying a similar message? I respect his views but am an independent operational meteorologist that gives a lot of weight to observations, pattern recognition and analogs. Pattern recognition/using analogs is how operational meteorologists worth their forecasting weight can beat model scores/forecasts most of the time. Technical/charting analysis using pattern recognition helps predict commodity/stock price moves as well as being useful in many realms in science. I see a pattern with the monthly PDO index, you obviously don't. I'm not sure if this means that you agree with Bob Tisdale on this but am puzzled about the reason that you brought him up. "I am relating my own view/analysis of what I see. Are you thinking that Bob and I are on the same team or should be conveying a similar message?" The fact that no two science deniers can ever agree on an actual explanatory theory suggests there is no evidence behind any of it. If there were a real alternative with real evidence then that evidence would have at least convinced most of the other contrarians and there would be a "denier consensus". Instead we have a wide range of pet theories that are only linked by the common thread of "anything but CO2"
If you cannot even convince the rest of your AGW denying friends, what chance do you have of convincing the rest of the world? "Technical/charting analysis using pattern recognition ... "
Why use all that sciencey, computery stuff when you can eyeball it, use your gut feelings, take a guess and follow your pre-formed prejudices. Darn it. Next you will be talking about facts! Still no attempt to say where you get your assessment of "high confidence" from despite two further posts. Just admit you made it up to beef up a very weak argument. Technical charting used to analyse stocks uses various trading indicators, not simple eyeballing. In any case, technical charting in share trading is useful only as a predictor of human behaviour - because other people use it. It doesn't pretend to have any predictive worth on the basis of intrinsic share price alone. I am relating my own view/analysis of what I see. In other words, your scientifically weightless opinion. Yes, I think we got that. Are you thinking that Bob and I are on the same team or should be conveying a similar message? Coherence amongst deniers? No, I wouldn't expect anything as scientifically evolved as that. But rather than just wave it away, I would like to hear you explain to me why not a one of the long-scale PDO reconstructions demonstrates a ~60y period oscillation. Bob shows this with commendable clarity and I had hoped that you might actually look at a link to fellow denier. Clearly I was expecting too much. If all you are going to to is bloviate, don't bother responding. I guess you already know what all the natural climate cycles are and how they work. I am still trying to learn because I know there is much more to learn. 33 years observing the global atmosphere and how weather patterns effect crop production and energy demand is far to short a period of time for me to know everything. However, it has provided me with insights that I enjoy sharing. I understand if you see it differently and would think that you would understand if somebody else saw it differently than me...........that is, unless you really do think that all is known that can be known about climate science and natural cycles and everybody else should assume the same thing. No one has ever claimed to know how everything works with the climate. The difference is that a consensus of opinion forms when sufficient evidence is found to back a theory, no evidence contradicts that theory, and no alternate theories are able to fully explain the known evidence. For a scientific theory to be sound, it is not enough that you can show some correlation or trend. To replace a sound theory, you need to explain everything the previous theory did, explain something that the previous theory could not, provide a plausible mechanism to explain the difference, and successfully make predictions using your new theory that are more accurate than the old one. Only then is it valuable. Contrarian hypotheses only ever do (at most) one of these. Maybe they come up with a mechanism, but then this mechanism fails to explain the observations or make accurate predictions (e.g., cosmic rays). Or maybe they can fit the observations, but there's no mechanism and no predictions (e.g., your idea here). In no cases has a denier managed to explain something with their own pet hypothesis that cannot be explained with the prevailing theory, and never have they made an accurate prediction. Most of the time they just nitpick little issues (or things they think are issues), and claim the whole theory is therefore invalidated. This is not science. Note I never said it was required to explain or understand everything. No one would ever say this is necessary. But you have to do the above if you want to be taken seriously. No denier has ever done more than one of the above items with a single one of their hypotheses. The result of this is that they haven't even managed to convince the other deniers. Ask ten deniers what has caused the recent warming and you will get ten different answers. Consensus forms when there is a preponderance of evidence, and the lack of consensus is an indication of a lack of evidence. This is how it should be obvious, even to someone with no understanding of climate science, which side has the evidence on its side. And this is why consensus matters. It doesn't mean they're right, or that they know everything, but it means that the evidence supports that view. And in science, evidence is king. Mike, before you show any more of your supposed insights about the PDO, check them with the facts. Try reading some climate science papers for a start. As Ramiro explained, gut feeling doesn't count for much in science. I've been driving a car for forty years. It doesn't mean I can explain all the technical details of motor mechanics. Nor could I walk in off the street and get a commercial drivers' licence - I'd have to learn some stuff first. Nor could I explain all the physiology behind my semi-automatic reflexes when driving. I'd have to get a medical degree for starters, and then do lots more research. Studying weather for cropping in part of the USA is a whole different beast to understanding of the earth and its systems and what drives ice in the Arctic. Is there a connection between the PDO and Arctic ice? Yes, from the literature there is an interconnection between the PDO and weather in some parts of the Arctic. Does that mean a 30 year cycle? No. The PDO doesn't have a set period for being in a particular phase. It could be long or it could be short. Are there other described multi-year oscillations that affect the Arctic ice? Yes. Are these in phase with the PDO? Not necessarily. Many of us are learning. You as a meteorologist seem to think that forecasting weather makes you a climate scientist as well. It doesn't. A large proportion of weather forecasters in the USA admitted in a recent survey that they don't even accept climate science. They know little about it. You are in that large minority. You can't expect to be taken seriously on any aspect of climate science when you don't even accept the basics. Nor when you make simple mistakes like you did in this case. All I can do is present my view. I can't over ride cognitive bias to allow minds to open or prevent others from verbally discrediting me. Just know that I come here in peace(not trolling). It's because of high confidence that my decades of observing the global atmosphere(not just part of the USA-as Sou asserts) has allowed me to see just a few unique elements playing a role in climate change.................not as the driver of a car is, as Sou asserts, of which there are billions but more like inventor Henry Ford, who had some ideas regarding the manufacturing of cars that others had rejected. I'm no Henry Ford but there are few people with more experience observing the global atmosphere. What, you are an open-minded Henry Ford type character with an open mind and no cognitive biases? And by implication we are not? That is just delusional arrogance. If you refuse to engage with the people here by answering their simplest questions how can you expect to be taken seriously? Your only chance to open our tiny closed minds is to answer some questions when they are put to you. You cannot blame people for getting bored with you when you will not attempt to answer so they turn to "verbally discrediting you". Not really surprising is it? Oh, by the way. What do you base your claim of "high confidence" on? What, no answer? Oh bother. I will have to find someone else to open my mind. That's BS. There are thousands of climate scientists and meteorologists. Appealing to yourself as "the authority" counts for zilch. You may think you have experience in observing the global atmosphere but your comments here and those you've shown us elsewhere show that you don't understand what you see. You long ago demolished any credibility you think you're owed when it comes to climate. Stick to weather forecasts. You're probably quite good at that. You're out of your depth when it comes to climate. I thought a picture of the PDO would be worth a thousand words. Obviously you don't see that. Let's try this oceanic cycle from the Atlantic. Again, the periodicity is not exactly 30 years but with high confidence, this natural cycle exists and has a tremendous influence on the atmosphere and effects Arctic sea ice. How do you know that the AMO is not contaminated by - if not largely composed of - the anthropogenically-forced signal? The problem with opinions is that they can be complete nonsense. Is the periodicity of the anthropogenically-forced signal ~30 years? Is there something about CO2, that has increased every year, that caused 30 year oceanic cycles, even back when CO2 was at lower levels? Could be that it has/will amplify the natural oceanic cycles as they store and expel more heat than before............but the cycle was there before CO2 went up. Is the periodicity of the AMO 30y? Consider this a short lesson in how scientists think. This paper suggests some Arctic sea ice decline due to the AMO. Based on an 80 year cycle. Meteormike - the whole natural cycles schtick is a red-herring. An internal or oceanic driven cycle adds nothing to the energy budget. It may be a source of natural variability, but that's it. As far as the Earth's energy budget is concerned there are other lines of evidence (satellite measurements, OHC, phenology, limnology) that cannot be explained by any 30 year cycle. This has always been the denier's conundrum - none of the various denier theories du jour are able to explain *all* of the facts. This is especially true of paleo-earth. So if we squint hard we can state with 'high confidence' that a 30 year cycle exists - but it doesn't explain much of anything. The only coherent, consistent explanation for all the evidence we have on both past and present climate is the GHG theory. That's it - it's the only game in town. It would be more interesting if we actually had two or three possible candidates, but we don't. The only question is why some people just simply can't accept that fact. There is no alternative theory to support, but they're dead set against accepting the only theory that works. I don't know what the answer is to why some people think they're smarter than all the climate scientists in the world. Look at Dr Woy's recent article on CO2: in it he posits that ocean outgassing is responsible for the increase in atmospheric CO2. This despite a dozen lines of evidence that says the increase is *all* due to humans. Think on that, a man with a hard science PhD makes an assertion that any reasonably intelligent high schooler could debunk. What level of denial has to exist to even entertain such a stupid notion? Does he really think he's smarter than all the climate scientists in the world? Does he think they've never studied the issue? What is the difference between you and Dr Woy? When the regulars/professionals here get to the point where the "idiocy" just gets too much - and when you have pointed out all the "obvious" flaws to no effect, then the desire to have fun and say uncharitable things undoubtedly becomes overwhelming. But if you are not a domain expert, like myself, things can be seen differently. As a non-expert who does not doubt the broad thrust of the scientist’s position, I am sensitive to premature labeling of contrarians. (Though on each occasion that I have concluded that a contrarian poster was sincere, however deluded, I have been wrong - including the one time I posted something here. So I do accept that Sou “has a nose” for dedicated time-wasters and the cynically insincere). “ a picture [is] worth a thousand words … you don't see that … Let's try[another example] … with high confidence … this natural cycle exists and has a tremendous influence”. (I suspect is a profound difference of perspective hiding behind the words “high confidence” in the foregoing, to mention but one issue). Here is my request of the “regulars” – just deal with what arises from his post, take it slowly and do not throw jargon around without basic justification/explanation. My request of MMike is simple, it is to engage with the examples – in particular because anything that smells of obscuring the terrain, or confusing the issue, invariably leads to cynicism regarding motives. (It's obviously the preferred method of avoidance by those challenging the scientists and it is VERY obvious). Imagine if there was then a serious danger that some of us non-participants might actually learn something!? If you are not a domain expert then there is an understood obligation to answer basic questions put to you as well as you can. If you ignore them then you tend to lose any goodwill. Any honest question will be answered as well as possible. Also Meteormike portrays himself as a domain expert and behaves like he is one but without the expertise. He has had his chance to answer basic questions put to him and has wilfully ignored them. The post you highlight is at the end of a long string of posts in which he has been offered several opportunities to redeem himself. He did not take those chances. Anon123, we've dealt with "what arises from his post", which is pathetically little - and what little there is, is spattered with denier memes. Meteormike refuses to "deal with it". He continues to avoid the questions and challenges put to him by self-aggrandizing (appealing to his own "authority") and tone trolling. Here is my request of MeteorMike – just deal with what arises from the regulars posts, take it slowly and do not throw jargon around without basic justification/explanation. Or to put it more simply: just answer the bloody questions. "The first step in having any sort of fruitful conversation between 2 groups, is for both parties to agree on something......"
Exactly. And to do that you have to state your case, provide evidence and answer questions people raise. Then you can reach a shared understanding and agree. Then you can build a dialogue. If you ignore them and just restate the same points that have been questioned then there is no shared starting point. By the way I did above what you should have done - cited a paper that gives a figure for AMO influence on Arctic sea ice extent. No thanks needed. Also noted are intentionally inflammatory comments, directed at me because I'm a "denier". If that makes you feel better to act like bullies, fine but you won't get me to respond in a similar fashion. Stop playing the victim. You are posting inaccurate but assertive comments and not answering questions. This irritates other commenters. By no stretch of the imagination are you being bullied. Meteormike - a denier is simply someone that denies the scientific evidence. The only scientific theory that explains both past and present climate changes is the GHG theory. Now, you can either accept that or wear the label denier - not because we want to demonize anyone, but because it is what you will be doing - denying the truth of the only theory that works. It's simply a factual description. The question I asked goes unanswered, what makes you different that Dr Woy? A victim I am not nor would I feel comfortable playing one. There's a difference between that and trying to get along. Thanks for repeating your question. Since I don't know who Dr. Woy is or what her/his views are, pardon my ignorance/ please elaborate. As Meteormike just does just not get it I will take you on a bit while he is getting his breath. I do not think your absolute statement "The only scientific theory that explains both past and present climate changes is the GHG theory." quite bears full scrutiny. Perhaps you could clarify what you mean? Aerosols? Meteors? Volcanos? ForceX? And what makes him different to Dr Roy? A PhD? "Since I don't know who Dr. Woy is or what her/his views are, ..."
He gave you a reference - presumably you did not bother to read it? If you had you would know who he is. "there's a difference between that and trying to get along." This is you trying to get along? Must try harder. So the bullied are not victims nor do you claim to be bullied? Come on. 'Trying to get along' is incompatible with yet more irritatingly shallow rhetoric and a further evasion of the point, which is that this is about *your* behaviour. May I try a re-statement? Paleoclimate variability is inconsistent with a weak climate system response to changes in GHG forcing. I guess everybody choose to ignore my evidence. If you have evidence that the AMO drives the centennial climate trend, you should share it. As Kevin O'Neill pointed out above, natural variability doesn't create energy. It only shuffles it around within the climate system. So how does natural variability drive a centennial warming trend? Where is the energy coming from? While considering present climate change, it's worth bearing in mind that paleoclimate behaviour becomes difficult to explain unless GHGs (mainly CO2 and CH4) are efficacious climate forcings. The main disagreement is over exactly how much the atmosphere is and will be warmed by CO2.........which leads us to completely different future projections. When there is any robust evidence that climate sensitivity to CO2 forcing has been substantially over-estimated, you can say this. Here and now, it is unsupported assertion. "Paleoclimate variability is inconsistent with a weak climate system response to changes in GHG forcing. " That is much better. Would get you banned at WUWT if you posted that there!